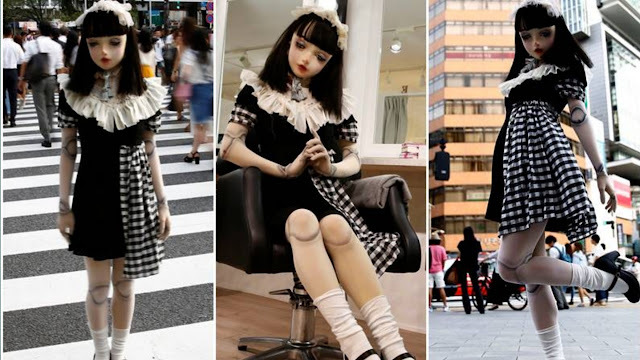 What moves in people's desire to turn themselves into living dolls is hard to say, apparently they lack something in life or they just do not feel good in their body. An amazing and at the same time an alarming phenomenon. Today we will tell about an amazing girl from Japan, whose appearance can not help but surprise you for sure. Looking at Hashimoto Lulu ( Lulu Hashimoto ) it seems that she is not a living person, a doll that you can put in a cupboard and enjoy from time to time. However, she is quite alive and enjoys great popularity in Japan. Lulu is alive in the literal sense, as for her image she puts on her head a special mask of a doll and a wig, as well as stockings on her hands and feet with a pattern that imitates puppet joints. It was designed by her designer Hitomi Komaki. Amazing yet Weird right?? What do you think about this?